India vs New Zealand 2nd T20 match – India won by Seven Wickets, the T20 Series is tie by 1 – 1 . . .
India vs New Zealand 2nd T20 match results India tie-up with New Zealand for 1 – 1 in Three match T20 Series. India defeated New Zealand by 7 wickets. 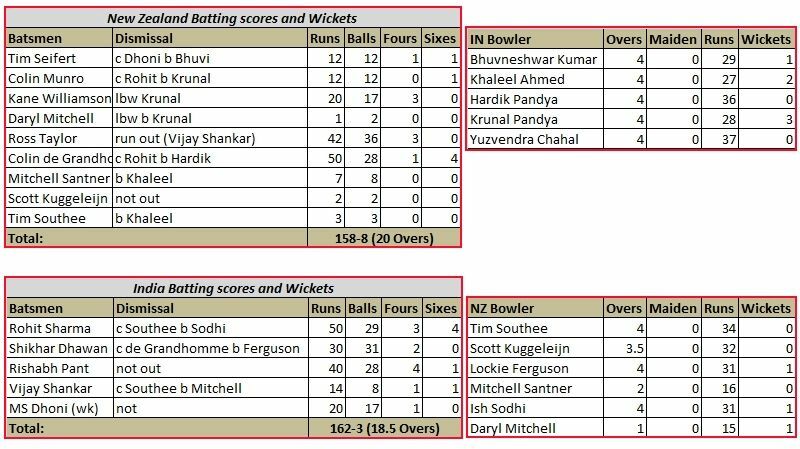 New Zealand batted first and scored 158 runs in 20 overs losing 8 wickets, following on runs Indian team played well and scored 162 runs within 18.5 overs losing 3 wickets. 2nd match between India and New Zealand is played in Eden Park, Auckland yesterday. Next and final T20 match will be played on 10th Feb 2019 at Seddon Park, Hamilton. Colin de Grandhomme is the highest scorer from New Zealand, he scored 50 runs in 28 balls and Ross Taylor scored 42 runs in 36 balls. Krunal Pandya and Khaleel Ahmed taken 3 and 2 wickets respectively. Rohit Sharma scored 50 in 29 balls, Rishabh Pant scored 40 runs in 28 balls not out, Shikhar Dhawan scored 30 in 31 balls and MS Dhoni scored 20 in 17 balls not out. Daryl Mitchell, Lockie Ferguson and Ish Sodhi each grabbed 1 wicket. Final T20I match is scheduled to play at Seddon Park, Hamilton on 10th Feb 2019 i.e. Sunday. Please let us know your views in comments – Whether 2nd T20I win is Victory for Indian Cricket Team or Survival in the T20I Series !!! Previous articleDo you know which Bollywood movie Collection is on peak in 2019 ??? – Get the Latest list here. Next articleTotal Dhamaal full comedy movie – Anil Kapoor & Madhuri Dixit once again !! !